This beautiful holiday villa is a high-quality group accommodation where you can enjoy all the peace and space the surroundings have to offer. There's a modern kitchen diner with a beautiful view of the green surroundings from both the dining area and the kitchen. Everything exudes luxury and prosperity. Whether you're staying in the spacious living room with fireplace and luxurious sofas, in the wonderful kitchen diner or enjoying the beautiful garden with flowers and plants from the covered terrace, everything exudes peace and space. You can go swimming in the beautiful, large pond! Would you like to return home completely relaxed after your holiday? Then use the professional, wood-fired Finnish sauna for a fee of 100 euros. 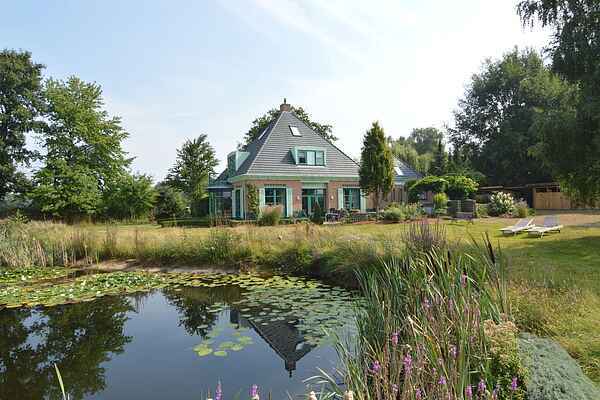 The villa is located in the Achterhoek, one of the most beautiful parts of Gelderland, near Twente, the German border and the Zwillbrocker Venn. Flamingos have successfully started nestling here again. The surroundings offers many possibilities for hiking and cycling, canoeing on the Berkel river and of course for exploring cultural and historical sight like the fortified town of Groenlo (Grolsch), book town Bredevoort, the grain and water mills, farmhouses, various museums and other attractions.